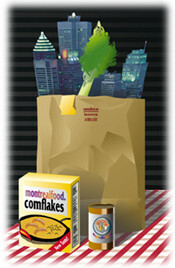 Shopping for food in Montreal is not the ordeal it used to be. Not too long ago, major grocery chains were closed at five on Sundays. A little further back, and they weren't open at all. Finding "exotic" ingredients, like habanero chilies or cilantro, were all but impossible just ten years ago, unless one went to specialty or ethnic grocers. Still, you'll be hard-pressed to find such esoterica as lemongrass or galangal in all but the most narrowly-targeted Asian markets, unlike in places like major grocery chains in California, where it not unusual to find the galangal next to the cardoons. Still, we're coming up in the worldslowly.